Welcome on the API parents association of Valbonne / Sophia Antipolis. We hope you will find all of the information necessary to help you understand our association and the role it plays in local schools. We would love to have you join our parents' association. By clicking the links on the English menu, you will be able to find out further information on API, how to join and how to contact us. We have translated key pages into English to help you understand API and its purpose. However, there are still sections of our website that are in French only. Some guidelines are included below to help you find relevant information using these menus. Please do not hesitate to contact us ( ) if you have any questions or need further information. We will be more than happy to answer your questions! The "API" menu includes key information about API. This section includes the same information as the French menu "L'API". 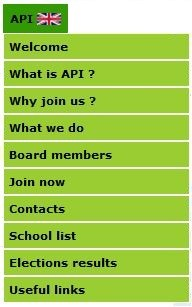 From the top menu, you can choose one of the 4 schools where API is present to get information such as description, contacts, API representatives, calendar, etc. The menu "Informations" includes the global school calendar ("Agenda complet") and a few useful links. The menu "Connexion adhérent" give access to information reserved to API’s members.